I think I've decided to make 2017 the year of the tree, at least as far as painting goes. Some of my earliest subjects, when I began pursuing fine art, were the karri trees of the southwest. These are among the tallest trees in the world and I produced quite a few paintings where karris were the star. But in recent years I haven't really used trees as a focal point. Sure, they've been there in the landscape but, since the karri paintings, I have rarely studied trees as a subject in their right. First cab off the rank for my "year of the tree" is a studio painting of a group of whitegums, or wandoo, which I found on a farm not far from home. Whitegums are endemic to Western Australia and have a beautiful creamy, honey-coloured and mottled-grey bark that positively glows in light or shade. Older whitegums, especially those in exposed positions, have a tendency to lose limbs over the years and to twist and turn as the elements take their toll. With branches snaking in all directions as they compete for light, and sometimes falling to the floor or getting hung up in other branches, the trees take on a kind of organised chaos in their constant struggle to survive. 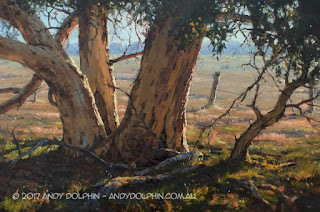 In this painting, I attempt to capture some of that chaos by looking at the base of a group of whitegum trunks. I don't know if this is one tree that divided early in its life, or if three separate trees have survived for years huddled together. I suspect the former. At 60cm x 40cm, this painting is somewhat bigger than the paintings I was doing leading up to my recent hiatus. The larger surface gave me the opportunity to explore the seemingly random pattern of branches in the tree canopy. One important achievement in this piece was to get a sense of the reflected light illuminating the shaded sides of the trunks. Those are interesting colours to mix because they look like dark mud on the palette and yet have a warm glow about them when placed in context in the painting. The "mud" really came to life when the bright highlights were added to edge of the tree trunks. Fantastic! You've captured the light and the shadow perfectly. The painting just glows. Glad you're back with the brushes! Thanks Doug and AK. I hope to do some videos again before too long.